The Coop Home Goods - Waterproof Hypoallergenic Cooling Bamboo Mattress Pad Protector Cover. Our proprietary polyurethane backing is 100% waterproof - preventing leaks that will damage or stain your mattress. Best of all it is quiet and noiseless and doesn't change the feel of your mattress like other pads do. Use it under your bed sheets. 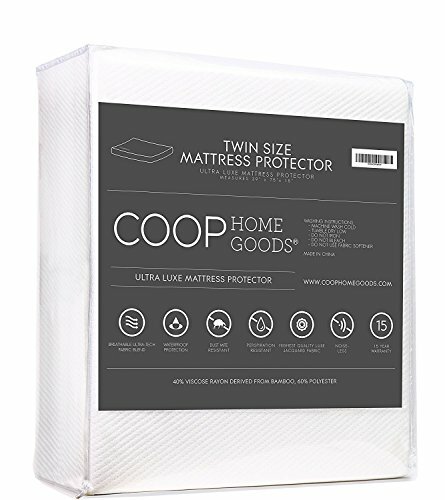 Coop Home Goods mattress protectors are a must have for those who suffer from allergens, like pollen or dust mites - the mattress cover blocks allergens, dust mites and bacteria from getting into your mattress. The Bamboo fabric provides a cooling effect that helps prevent overheating or sleeping hot. The polyester is absorbent and prevents accidents from spilling over. There is no risk in trying our mattress pads. Try it and if you don't like it return it for a full refund within 30 days - Backed by a 15 year warranty. This mattress protector is great for kids, pets and pet dander, expecting mothers, post pregnancy, incontinence and just about any accident that could damage your mattress. Coop Home Goods Mattress pads are compatible with Simmons, Sealy, Serta, Tempurpedic and many more mattress brands. Mattress pad warranty void if washing instructions are not followed. We recommend that you wash your mattress pad regularly to remove allergens or dust mites that may have gathered on the surface of the mattress pad. Even the smallest stain could void your mattress warranty. Our mattress pads offer the ultimate protection for your mattress from accidents. Our mattress cover is 100% waterproof and protects against perspiration, incontinence, pets, and any other fluids that could void your mattress warranty. The Polyester and Rayon Viscose derived from Bamboo mattress topper features our proprietary polyurethane backing. Does not contain PVC, Vinyl, or phthalates. OKEO-TEX Certified. Cooling Lulltra Polyester and Viscose Rayon derived from Bamboo blends to keep you comfortable through the night. Our waterproof membrane allows for airflow while you sleep providing protection and breathable comfort for a good nights rest. The mattress pad is noiseless, no cheap crinkly plastic sounds. The AccuFIT Mesh band expands to fit mattresses up to 18in deep. Perfect for use under your sheets. HYPOALLERGENIC - Protects your mattress against allergens, dust mites, bacteria and pet dander. Easy to care for - Machine Wash Cold Tumble Dry Low. Do not Iron. Do Not Bleach. Do not use Fabric Softener. 30 Day Money Back Satisfaction Guarantee and now with 15 year Warranty. Available in Twin, Full, Queen, King and California King. If you have any questions about this product by Coop Home Goods, contact us by completing and submitting the form below. If you are looking for a specif part number, please include it with your message.